If Nico Hoerner was a stock, investors would be bullish on his outlook. Coming off a successful turn in the Arizona Fall League and now putting up video game numbers in spring training, Hoerner’s name on everyone’s lips. But he’s not the only prospect ascending in the system. Catcher Miguel Amaya, outfielders Cole Roederer and Brennen Davis, and pitcher Brailyn Marquez would fill out the top 5 in my portfolio. After that, an investment in many of the Cubs’ prospects would represent more of a risk. A good number of the players who should be at AA and AAA have had up-and-down careers and most in the low levels haven’t done enough to prove anything. But there are still several who could be worth your investment of time this summer. Here’s a little prospectus when it comes to options from AA on down. I have loved him since he was at Eugene hitting .137 in his first full month in 2017. Even then, you could see the approach was there: the pitch recognition, and the swing, a beautiful uppercut power stroke. The balls were just not falling in for him. He took off in August that year and hasn’t stopped since. 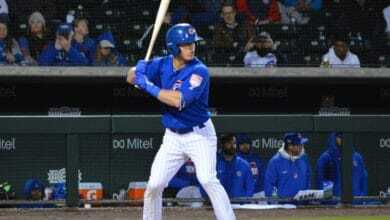 The 2018 Cubs MiLB Player of the Year has shifted from second base to first and has been playing the outfield while hitting dingers in big league camp. He will be at AA to begin 2019. Invest now. Like Young, Weber has a smooth left-handed stroke. He might not have as much power, but he has great pitch recognition skills on par with Mark Zagunis. He can play elite defense at all four infield spots and is the calmest player on the field in any situation. He knows what he is doing at the plate and could begin 2019 at either South Bend or Myrtle Beach. Even though he was just drafted last summer, he’s going to be 24 very soon and should skip South Bend to find himself in the Carolina League to begin the season. With a .367 wOBA and 127 wRC+ last summer at Eugene, Reynolds proved he is an offensive force that is easily above average. While he was drafted at third base, he will likely move to first this year. He could move fast this year because the bat and approach are special, but the issue down the road is where he will play in the bigs. These are two pitchers I can see in the majors eventually. Miller, who has more room for growth and is still filling out his frame, has improved his fastball by a few ticks with the same good command. He should be at AA to begin this year. Investing in him would be a smart move as he continues to grow by leaps and bounds. Clark has had major league stuff since he was drafted in 2016. He ended the 2017 season healthy enough to weight train in the offseason and he came out in 2018 throwing 95-97 mph. A short DL stint in 2018 allowed Clark to head to the AFL, where he was an All-Star in the first half. He should be at AA to start this season. He definitely has major league stuff, but the issue has always been staying healthy. He had a 2.57 ERA the last six weeks of 2018 and just turned 22, so he should should love pitching in Myrtle Beach, a definite pitcher’s park. I really like all of them but none have played above Eugene. Casey, Cruz, and Thompson all had their moments last summer, while Allen and Garcia were in Mesa. Casey and Cruz are well polished and controlled, Thompson has the most electric stuff and hits 95 consistently. Garcia just raked in Arizona last summer, batting .302 at just 16 years old. A switch hitter, Garcia is likely to be in Eugene come June. Meanwhile, Allen has good command and a wicked curve from the left side and had a 0.63 ERA in just 14.1 innings of rookie ball. Yes, I have remained on the Albertos train. He’s still just 20 years old and was throwing around 95 despite all of his troubles last year. His movement was great, it was just nowhere near the zone. You could buy him pretty low right now, but he could be a top-of-rotation type arm. He should stay behind in Arizona to get his release point down and build his confidence before heading back to South Bend. There’s just too much raw talent there to give up on at such a young age. The good thing about this prospectus is that most of the players profiled are still relatively new to the system and have all kinds of potential to grow as they advance. And no matter how you invest your time this summer, it’s bound to be fun.